Houshyar, F., Jamshidi, S., Sohrabi, M. (2014). Antimicrobial ‌in Vitro and in Vivo Potential of Five Lichen Species on Fusarium Equiseti and Pectobacterium Carotovora Pv. Carotovora Causal Agents of Potato Rots. International Journal of Advanced Biological and Biomedical Research, 2(Issue 4 (2)), 412-417. Farid Houshyar; Soleiman Jamshidi; Mohammad Sohrabi. "Antimicrobial ‌in Vitro and in Vivo Potential of Five Lichen Species on Fusarium Equiseti and Pectobacterium Carotovora Pv. Carotovora Causal Agents of Potato Rots". 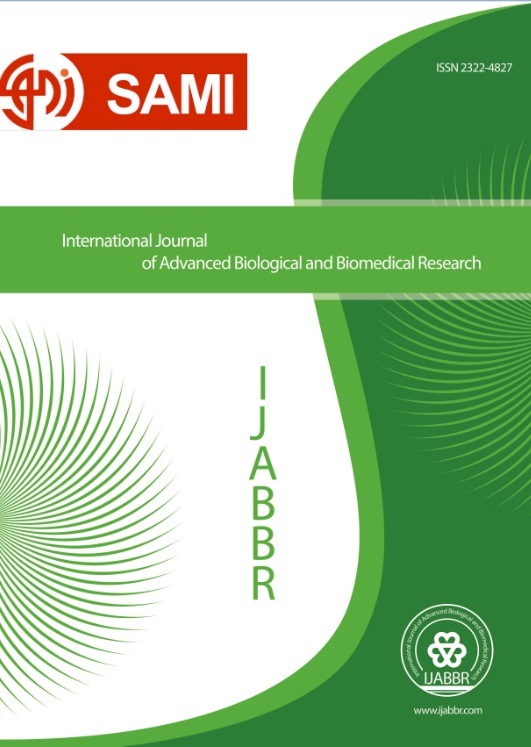 International Journal of Advanced Biological and Biomedical Research, 2, Issue 4 (2), 2014, 412-417. Houshyar, F., Jamshidi, S., Sohrabi, M. (2014). 'Antimicrobial ‌in Vitro and in Vivo Potential of Five Lichen Species on Fusarium Equiseti and Pectobacterium Carotovora Pv. Carotovora Causal Agents of Potato Rots', International Journal of Advanced Biological and Biomedical Research, 2(Issue 4 (2)), pp. 412-417. Houshyar, F., Jamshidi, S., Sohrabi, M. Antimicrobial ‌in Vitro and in Vivo Potential of Five Lichen Species on Fusarium Equiseti and Pectobacterium Carotovora Pv. Carotovora Causal Agents of Potato Rots. International Journal of Advanced Biological and Biomedical Research, 2014; 2(Issue 4 (2)): 412-417. Potato is one of the main crops which is suffering from the great losses in storage and the most conventional method of its tuber rot is using hazardous chemicals. Using antimicrobial potential of lichens can be one of the safe, green, environment friendly methods for plant diseases management. In this study, antimicrobial activity of acetone, methanol, chloroform extracts of Ramalina capitaat, Xanthoparmelia stenophylla, Umbilicaria cylindrical, Rhizoplaca crysoleuca and Anamylopsora pulcherrima were evaluated against two potato rot agents vic. Fusarium equiseti and Pectobacterium carotovora pv. carotovora in laboratory and storage conditions. Bioassay tests were disc diffusion and minimum inhibitory and bactericide concentration methods. Dimethyl sulfoxide solvent on paper disc was used as negative control. Positive controls were considered as %0.2 benomyl and gentamicin antibiogram discs for fungus and bacterium, respectively. There were no effect of lichens extract on fungus. R. chrysoleuca especially methanol and chloroform extracts of had remarkable bactericide and bacteriostatic effect on bacterium. The study with selected extracts in storage condition showed preventive effect of 80% of extracts on bacterium. The most protective effect was observed in methanol extract of R. chrysoleuca. Therefore, lichen extract would be promising biological product would be a potential replacement instead of chemicals.